A summary of some resources available online for programming in C# to produce software that will read data from files stored in Adobe portable document format (pdf). Step-by-step instructions and sample C# code are at the bottom of the page. the Adobe PDF Technology Center PDF Reference webpage includes links to the definitive pdf specification, including the PDF Reference and Related Documentation (over 15MB). Adobe publishes the full specification to "foster the creation of an ecosystem around the PDF format"
iText is a library that enables you to generate PDF files on the fly. The documentation says, "the iText classes are very useful for people who need to generate read-only, platform independent documents containing text, lists, tables and images; or who want to perform specific manipulations on existing PDF documents." 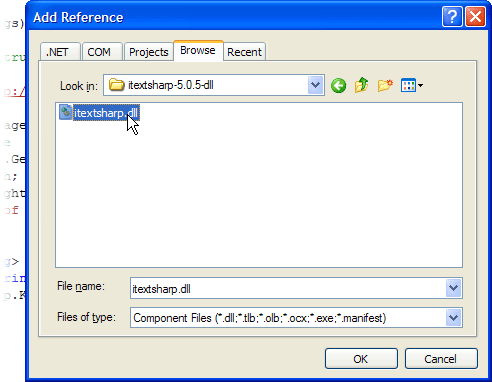 It is written for use in Java systems but there is a .NET port available: iTextSharp (written in C#), implemented as an assembly and downloadable from this page on SourceForge (Nov 2007) – see iTextSharp code example below. PDFBox is a Java library (see sub-bullet for how to use it in C# .NET) that lets you create new PDF documents, manipulate existing documents and extract content from documents. 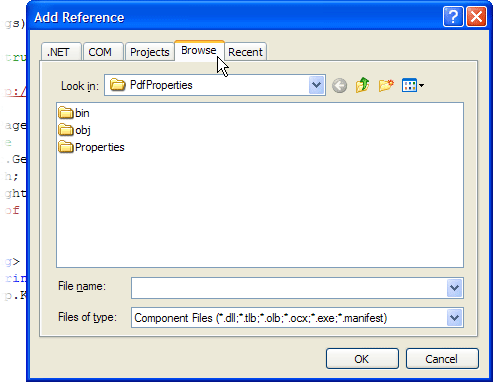 PDFBox also includes several command line utilities. Functionality includes; PDF to text extraction; Merge PDF Documents; PDF Document Encryption/Decryption; Lucene Search Engine Integration; Fill in form data FDF and XFDF; Create a PDF from a text file; Create images from PDF pages; Print a PDF. 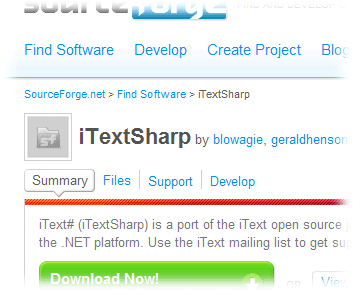 PDFBox can be downloaded from SourceForge. Some Open Source PDF Libraries in C# here include iTextSharp, PDFsharp, Report.NET, SharpPDF, ASP.NET fo PDF, PDF Clown, PDFjet Open Source Edition. Winnovative Software Solutions produce PDF Images Extractor for .NET is a .NET 2.0 library enabling you to extract images from a PDF file in formats such as bmp, png, jpeg, etc. It includes samples of C# code. An evaluation version can be downloaded and the full product can be purchased from their website. if you want to extract image files using a desktop utility instead of writing C# code, FileBuzz feature a shareware product called A-PDF Image Extractor v1.0.0 which can extract image files from a single PDF file or a batch of PDF files. It can save images in TIFF, JPEG, GIF, BMP, PNG, TGA, PCX, ICO, JP2 (JPEG 2000) and DCX format, and supports a variety of image filters used in PDF files including LZWDecode, FlateDecode, RunLengthDecode, CCITTFaxDecode (TIFF), JBIG2Decode (JBig2), DCTDecode (JPEG), and JPXDecode (JPEG 2000). Chris Hornberger wrote on Jul 2 2003, 6:59 am: "Create a Crystal report with the information you want on it, then simply export it to PDF. The fact that you're using C#, I assume you're also using VS Studio.NET and hence, have Crystal too. This will allow you to create your PDF file. Another choice is to spring for Adobe Pagemill and print to the PDF file format." 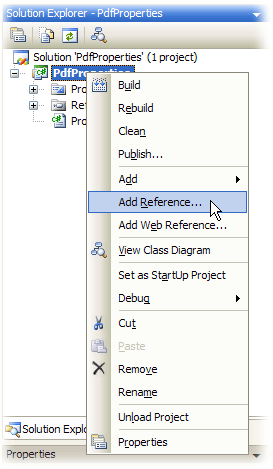 The brief article "Microsoft Visual Studio.NET: Crystal Reports" by Mujtaba Khambatti explains the benefits of Crystal Reports, designing a report, and using Crystal Reports in projects you create. 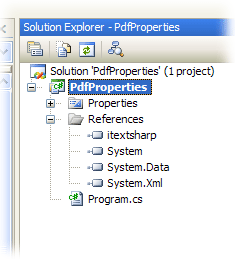 (5) You will now see itextsharp listed in the solution explorer under References. While you’re typing in the code, you'll notice when you type reader. that Intellisense gives you a long list of methods and properties – evidence of the breadth of functionality in this library. The example program code at the bottom is my own work, and I can vouch for that. It was produced in 2010.